The Shipwatch Square catalyst area is a community center. Centered along Rivers Avenue/US 52, a major north/south principal arterial roadway running through the peninsula, this area once thrived as a result of growth and military activities at the Charleston Naval Complex and drew people from all parts of the Neck. At the Rivers Avenue/McMillan Avenue intersection, a gateway entrance into the former Naval Complex area, two shopping centers and a hospital facility now sit closed, underutilized, or under demolition. A variety of small lot commercial uses, residences once used as base housing, and civic/service uses surround the intersection. A small area of light industrial uses backs up to the railroad tracks along Meeting Street from McMillan Avenue to Dorchester Road. The southern portion of the catalyst area is part of the Chicora/Cherokee neighborhood, which is part of LAMC. Reynolds Avenue, another entrance into the former Naval Complex area and a center of retail commerce when the base was in operation, is a neighborhood center that contains some local commercial uses, offices, and several churches along the area between Rivers Avenue and Spruill Avenue. 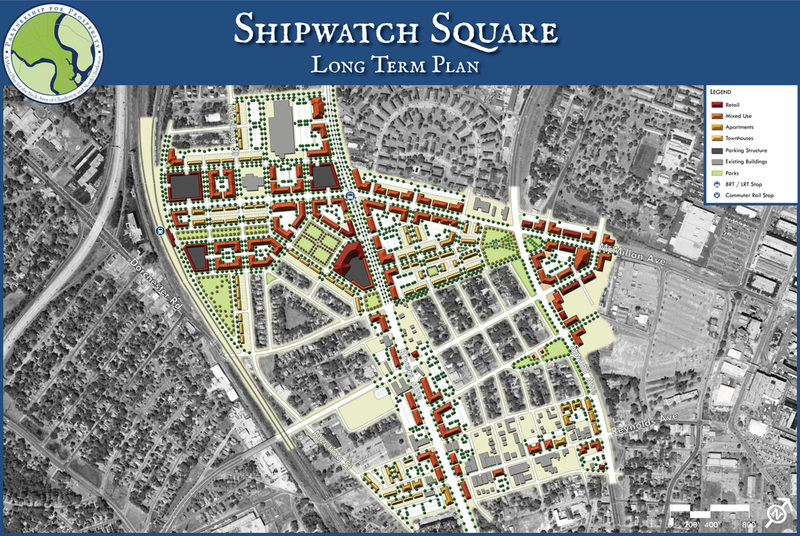 Future rendition of Shipwatch Square. This area has traditionally been a community center, offering goods and services to people from all portions of the Neck, as well as Navy base personnel living elsewhere. Its central location along the Rivers Avenue spine that traverses the peninsula and the McMillan Avenue crossroad that currently serves as a major entryway into the port industrial area along the Cooper River provides an easily accessible and highly visible location. As such, this intersection can provide the catalyst opportunities that begin the revitalization of this area. 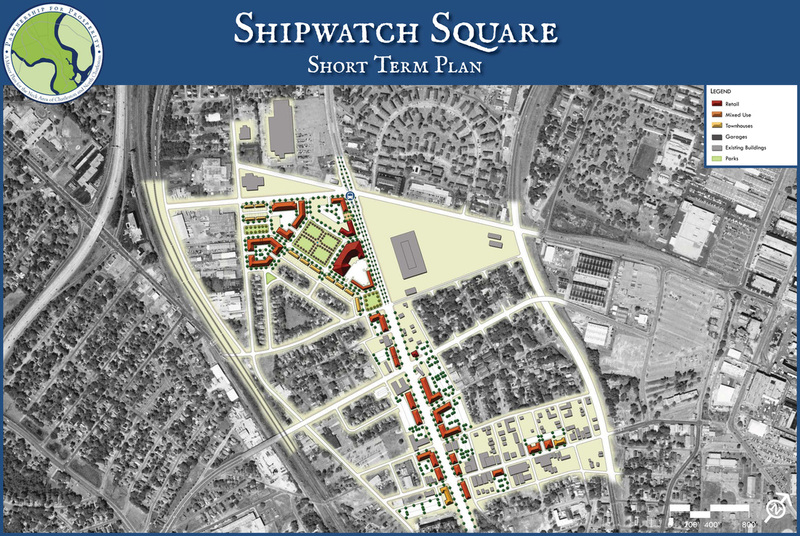 With the demolition of the old Shipwatch Square buildings complete, this site is ready for new development that serves the residents and employees of the Neck area. 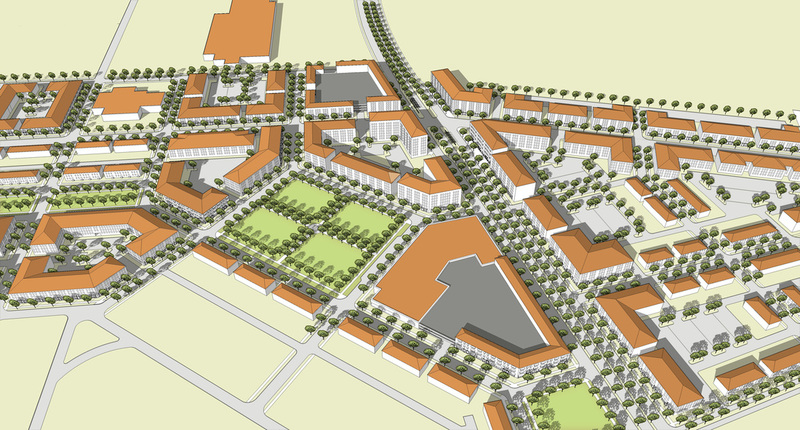 A mixed use core that includes a grocery store and drug store, along with open space for use by new residents and those of adjacent existing neighborhoods, can provide much-needed commercial activity and social interaction, and help spur other retail and civic uses in the area. Cosgrove Avenue is planned as a “through route” for freight movement to facilitate truck access to I-26 from the ICTF and industrial zones to the east and southeast. This makes the Cosgrove Avenue/Rivers Avenue intersection another important node in this catalyst area, with proposed uses and redevelopment being primarily non-residential and service oriented. Additionally, the blocks along Rivers Avenue between McMillan Avenue and Cosgrove Avenue become an important corridor connecting these two intersections, with an emphasis on multimodal access, pedestrian safety and comfort. Catalyst development can include mixed uses with ground floor retail uses and upper floor office and/or residential, as well as green spaces. 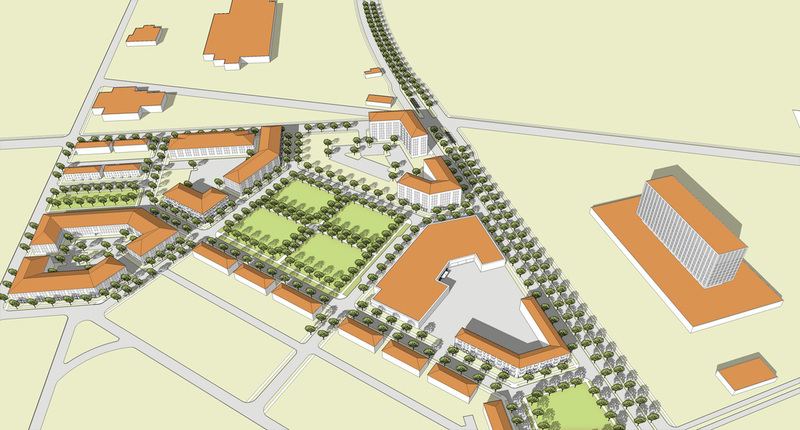 The Rivers Avenue/McMillan Avenue intersection is the core of this catalyst area and building sizes in this area are envisioned as mid-rise (5-7 stories), similar to that of the existing navy hospital. 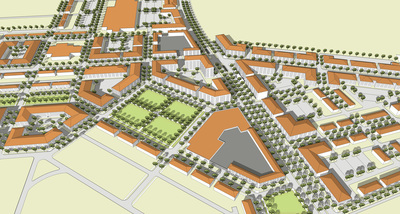 Development in the core area will capitalize on the regional and local connectivity provided by new transit service: a planned commuter rail station, a planned BRT/LRT station, and an expanded and relocated Super Stop for local bus service. 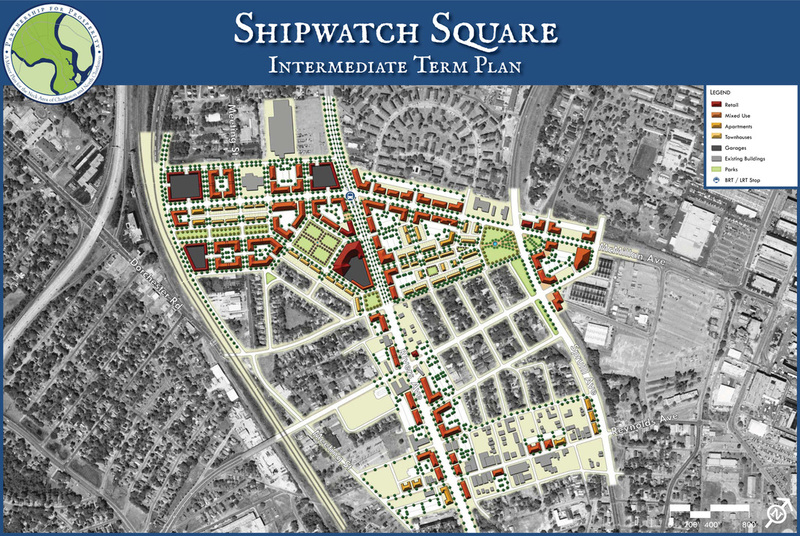 Shipwatch Square will be one of the most connected places in the Neck area. From this core, buildings will transition into mid-rise (3-5 stories) and low-rise (1-3 stories) further back to complement existing uses and neighborhoods. Rivers Avenue is an important freight route within the Neck area, but the Master Plan recommends a number of improvements and actions meant to balance the competing needs of users of this key roadway. 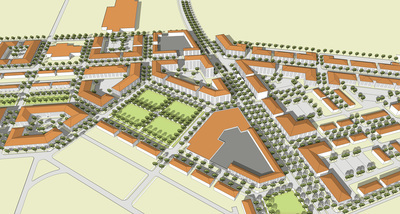 The preliminary planning level program derived from the Long Term Phasing Concept Plan shows that about 500 residential dwelling units and 700,000 square feet of non-residential uses could be developed in this catalyst area. 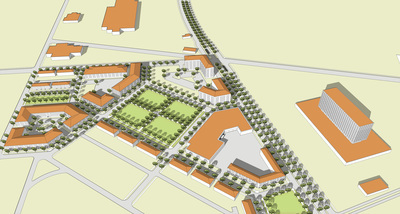 Operate a loop shuttle from the commuter rail station to development at the naval base.